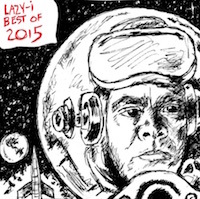 Today is the last day to enter to win a copy of the Lazy-i Best of 2015 Comp CD. The collection includes my favorite indie tunes discovered last year as part of my tireless work as a music critic for Lazy-i. Among those represented: Courtney Barnett, Clarence Tilton, Simon Joyner, Beck, Freedy Johnston, Ceremony, John Klemmensen, Natalie Prass, Digital Leather, Belle & Sebastian, plus lots more. The full track listing is here. Entering to win is super-easy, either: 1. Send an email with your mailing address to tim.mcmahan@gmail.com, or 2) Write a comment on one of my Lazy-i related posts in Facebook, or 3) Retweet a Lazy-i tweet. You also can enter by sending me a direct message in Facebook or Twitter. Contest deadline is midnight tonight! Don’t delay, enter right now. How was Dolores Diaz last night at O’Leaver’s? Well, I couldn’t tell you because I DNA’d — i.e., Did Not Attend. It being a school night. But good ol’ Kevin Coffey did, and here’s his review of the show. Also in attendance was Hear Nebraska, and here’s their photos and a brief write-up. And I’m told that the session was recorded, though there’s no guarantee it’ll end up posted at Live @ O’Leaver’s. Keep your fingers crossed. If you were there last night, post your review in the comments section. The folks over at Nowness today released a never-before-posted video of The Faint’s “Desperate Guys” music video. Why this was never released back when Wet from Birth was released in 2004 remains a mystery.